Code recognition of 1- and 2-hour wood-frame walls, floors, ceilings and roofs are predicated on successful fire and hose stream testing conducted in accordance with ASTM E119, Standard Test Methods for Fire Tests of Building Construction Materials or UL 263, Standard for Fire Tests of Building Construction and Materials. 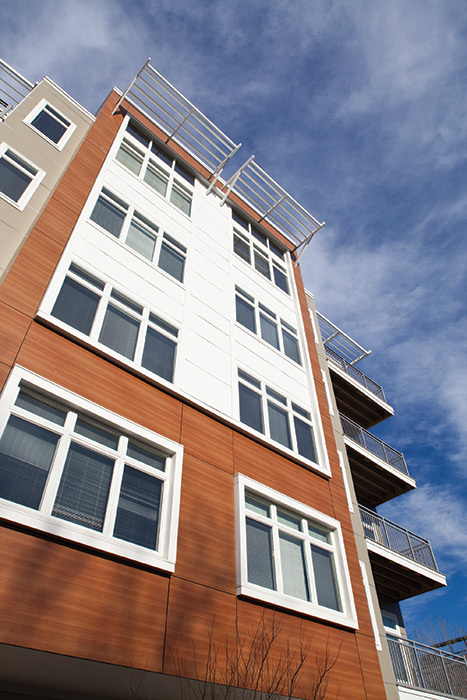 Depending on the application, building elements may need to be fire-rated from one side or both sides. For specific exterior wall applications where there is adequate fire distance separation from adjacent structures or the property line, the IBC allows wood-frame walls to be tested for exposure to fire from the inside only. Rating for both interior and exterior fire exposure is only required when the wall has a fire separation distance of less than 10 feet. For floors, ceilings and roofs, resistance to fire exposure is measured from below. For a detail of a 2-hour exterior wall assembly, see page 8. The fire resistance of exposed wood members may be calculated using the provisions of Chapter 16 of the National Design Specification® (NDS®) for Wood Construction (see IBC Section 722). AWC’s Technical Report No. 10 (TR10), Calculating the Fire Resistance of Exposed Wood Members, contains full details of the NDS method as well as design examples. Previous versions of the IBC contained a separate method of calculating fire resistance of exposed wood members, which was limited to 1-hour fire resistance. This provision has been deleted in the 2015 edition of the IBC, since the NDS Chapter 16 method has broader application and provides a more reliable calculation procedure. 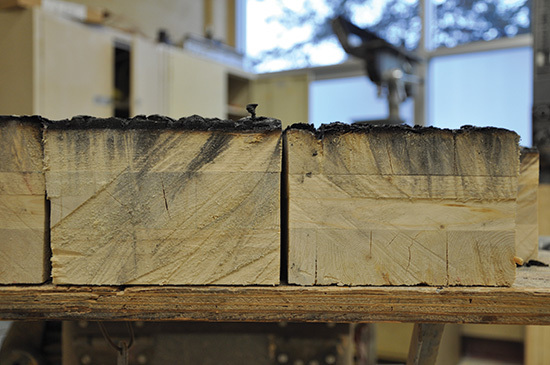 Additionally, with the 2015 NDS referenced in the IBC, the calculation method of determining a fire-resistance rating may now be used for cross laminated timber. Architect: CUBE 3 Studio. Structural engineer: Veitas & Veitas Engineers. Photo: CUBE 3 Studio & Rixon Photography. Vox on Two in Cambridge, Massachusetts, includes four stories of Type VA wood-frame construction over a Type IA concrete podium. A 3-hour fire-rated horizontal assembly separates the wood-frame residential portion from the concrete garage. Fire walls were also used to divide the wood-frame portion of the structure into four separate buildings for the purpose of determining allowable height and area. (See Fire Walls on page 5.) A project of Criterion Development Partners, the 335,500-square-foot structure was completed in 2014 for a construction cost of $46.6 million. Wood products such as the large beams used in heavy timber construction and cross laminated timber may perform better in a fire situation than noncombustible materials. Because these products are thick and solid, they char on the outside at a slow and predictable rate while retaining strength, slowing combustion and allowing time to evacuate the building. The char protects the wood from further degradation, helping to maintain the building’s structural integrity and reducing its fuel contribution to the fire, which in turn lessens the fire’s heat and flame propagation. Section 602.4 of the 2009 IBC has prescriptive provisions for wood members which meet the definition of heavy timber.